Yeah, but: See the December 2009 update. The Long Version: Cora's Pizza is one of those things that's difficult to rate. It's significantly better than the pizza chain that was a staple of my childhood, to the point where I can't remember when I last ordered pizza through a central dispatch phone number. But at the same time it's not nearly the best pizza that I've ever had. 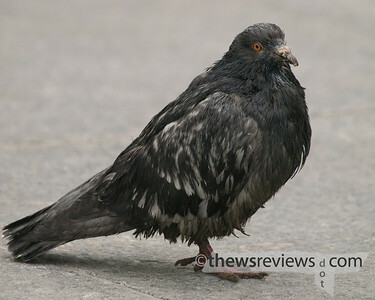 So how should I rank it? It's fast food. It's very generous portions for not very much money, even better than the chains. But it's still fast food, and doesn't rise above its station - nor does it really try to. It's a significantly above average performance in a fairly average product niche. I'm happy to go there for dinner every week or two, and it's where I take friends who want a quick and easy meal. But is it approaching perfection? Not really, unless perfection needs to come in under $5. 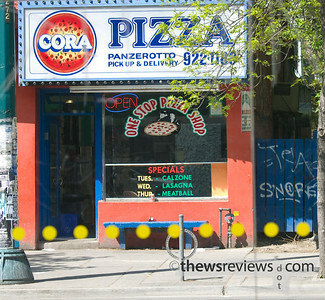 In an article eloquently titled "Cora Pizza closed after dead rats spotted", the CBC news website writes: Cora Pizza, a popular eatery near the University of Toronto, has been shut down after several dead rats and fresh rat droppings were found on the premises. The city of Toronto's Dinesafe website summarizes their inspection results in much less poetic language. The report from December 21 details four 'crucial' violations: "Operator fail to ensure food is not contaminated/adulterated; Employee fail to wash hands when required; Operator fail to prevent a rodent infestation; Operator fail to prevent gross unsanitary conditions." There were another eight violations that were merely 'significant', and four more minor ones. I had actually spent a few minutes copying and pasting some of them before I realized that I was actually looking at the results from their Conditional Pass ratings from June and March 2009. This review was written back when they only had one conditional pass (quickly corrected) and three previous Pass ratings. I'm not too fussy - after all, anyone can 'fail to use proper procedure(s) to ensure food safety' from time to time. But in this case, Cora not only had the health inspector shut then down because it was unsafe for people to eat their food, but then also didn't get the situation reversed in time for the follow-up inspection two days later. 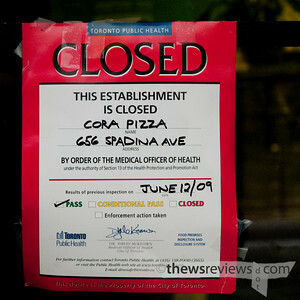 Cora did pass a routine health inspection on April 27, 2010. They then received a 'Conditional Pass' on June 7, and while they passed the make-up test the next day, the results of the earlier inspection look pretty familiar. The restaurant is now closed for renovations, and it looks like they're doing a thorough job. For what it's worth, this is probably a good time to renovate - the university students are gone right now - so there's no reason to think that the work is connected to the results. I just hope that they come back stronger. Yeah, but: Brown can sync the world of business. The Long Version: When I'm shopping on-line, it means that I can't find what I want locally. And if I'm getting a shipment from UPS, it means that I couldn't find any other method of delivery. 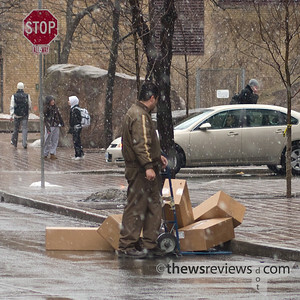 UPS might be an excellent service within the United States. I wouldn't really know, except that the only time I've received a package from them in the USA they just left it on the front porch. And maybe they treat business customers better than residential addresses. I don't really know about that, either, since in the many years that I've worked in shipping and receiving no company that I've worked for would use them. But I have met a couple of their drivers who were decent and helpful people, so that was a positive experience. The last package I received was the Ergo Pin for my scooter. I missed the first delivery attempt: something to do with the need to work for a living. Fortunately UPS had already already missed their initial delivery date, making the second attempt land on a day that I already had off. So I waited at home the next day to make sure that I didn't miss it again. Eventually, around 1:30pm, my partner comes home from an enjoyable time out that I've missed while waiting at home. As a consolation prize, she handed me another "failed delivery attempt" notification. This one had both the "second attempt" and "final attempt" boxes checked. The first CSR I spoke to suggested that the package was undeliverable because my buzzer code wasn't included in the address -- I asked if it was UPS policy to have their drivers walk into the lobby, shrug their shoulders, and leave again. The gentleman on the phone suggested that it wasn't. I then went through several sets of options. The CSRs that I spoke to initially told me that because it was so late in the day, there was no way a re-delivery attempt could be made. 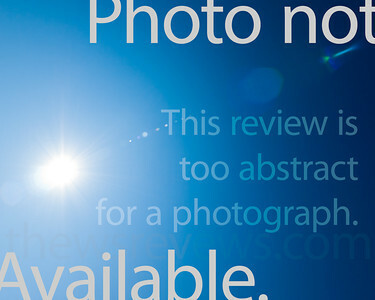 (I took some issue with the implication that any attempt worth the word had been made.) I could arrange another delivery attempt for the next time I was able to wait at home all day. Apparently 'the driver was in error' when he checked both second and final boxes, and they could try again. Alternatively, I could take an entire day to travel across the city to pick the package up myself, and save myself the suspense of waiting at home. Neither option was particularly enticing, as both meant that I would need to wait a week. I continued to request another delivery attempt, and was eventually called by one of the CSRs I had been speaking to to tell me that the driver was on his way back. Remember the lobby-and-shrug theory that I had? It turned out that the driver had used the first entry code that matched my last name -- not the one that matched my initial as well. He was apologetic, and what could I say? Not only did I get my package, I got an afternoon's entertainment out of it as well. Odds are that it will never happen again, because there's almost always someone else out there who will ship via FedEx or regular mail. At least there was no "brokerage" fee on this one. Yeah, but: It's cheap entertainment. 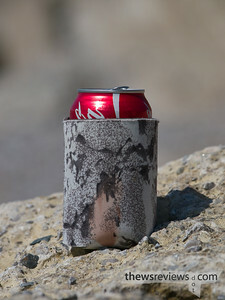 The Long Version: Originally bought for 97 cents in the 'hunting' department at a Wal-Mart in Fallon, Nevada, these can coolers provided faithful service. 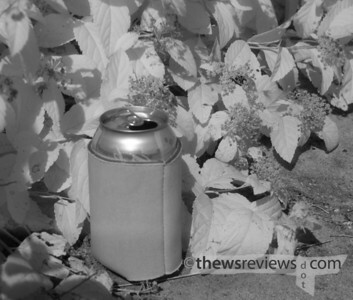 Although we never had the chance to avoid scaring away wildlife with a shiny metal can only partially hidden by a camouflaged cooler, it was good to know that it wasn't a danger. But I have to confess something. I'm a Canadian. I like these for their entertainment value as much as their function -- I had never seen such a ridiculous idea. (A little time with google has broadened my horizons, and I've found them in Woodland pattern, inspirational messages, and some of them even get intentionally silly.) But perhaps I shouldn't have been so naive. When I asked my brother if it was too embarrassing to bring with me when I got out of his Suburban on its 30" wheels, he turned to me and said, "Matthew, we're in Wyoming." Yeah, but: A lot has changed in forty-odd years. 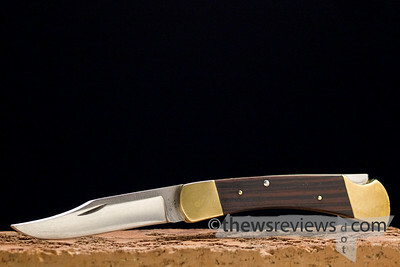 The Long Version: It's hard to say anything bad about the Buck 110, the most-imitated knife in the world. It's a heavy, rugged, tough design that's proven its value over decades of hard use. Amazon.com's brain trust has given it five out of five in ten out of ten reviews. How can I disagree with that? The reality is that I don't really disagree with the praise its earned, but the world has moved on, partly because of the impact that the Buck 110 has made. It was conceived as a folding hunting knife, and took its design cues from heavy sheath knives and slip-joint folders. Good heft and a belt pouch were assets, and in some ways they still are. As a utility knife, it's the one I choose, despite it being older than I am. 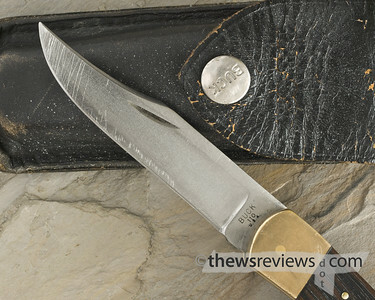 But modern knives frequently use better steel, are lighter, easy to carry, and open and close with one hand. The addition of a pocket clip means that they no longer need a pouch/sheath to carry them, and plastic or fiberglass and titanium handles cuts the weight and makes it more convenient. I have a selection of knives from Benchmade, Spyderco, and Cold Steel that I carry as working tools while my Buck 110 stays home. It's a classic, and my Buck 110 has earned its retirement.